On October 5, 2009, Alarabiya.net posted an interview with an Arab Ahwazi man who was presented as a former undercover agent for the Islamic Revolutionary Guards Corps (IRGC). The man claimed that 40,000 well-trained operatives, mostly Shi'ites, are in the service of Iran in the ArabGulf states - 3,000 of them in Kuwait alone. He stated that the cells formed by these operatives were trained to collect intelligence, sabotage installations in the Gulf region, and assassinate senior officials. He added that Iranian Al-Qods forces commander Qassem Suleimani had prepared a plan to take over 22 embassies, both in Iran and outside it, if Iran were to be attacked. This interview is in line with a July 14, 2009 intelligence report posted by the Ahwazi Islamic Sunni Organization on its website (www.sonnaalahwaz.org ). The organization claimed that the report was based on classified Iranian Air Force information, according to which Iran has a comprehensive military plan to attack the Gulf countries using the MiG-31 aircraft that it had purchased from Syria. Thus, it said, Iran is preparing secret airports and camps in Ahwaz province, as well as forces in the northwest of the province, in order to attack Iraq, Kuwait, and Saudi Arabia. The report also revealed a purported IRGC plan to carry out terrorist operations in the Gulf countries, and alleged that Iran was developing chemical weapons in two top-secret plants in Ahwaz province, and was burying the chemical waste products in the province. Also according to the report, Iranian special forces belonging to the IRGC and acting outside Iran have the capability and the access to carry out biological and chemical weapons attacks, and had conducted joint maneuvers with Hamas and Hizbullah as well as with Yemeni Houthi forces, and also with Iranian sleeper cells in Iraq and in the Gulf countries. It should be noted that this organization claims to be operating with Saudi backup and support. 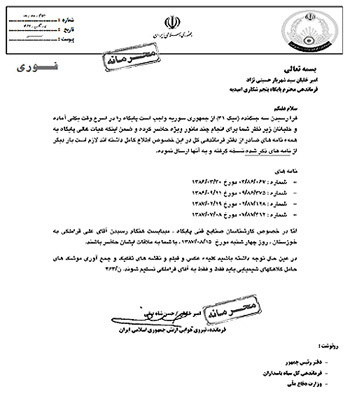 "In direct cooperation with the National Research Center in Ahwaz, and with direct support of the Saudi National Association [sic], we have succeeded in obtaining an important classified document issued by Iranian air force headquarters, signed by the commander [Gen. Hassan Shah Safi] and sent to the commander of the airbase in the city of Al-'Amidiyya, known as 'Airbase No. 5.' In addition, we disclosed a plan by IRGC [to attack the Gulf countries from its military bases located] near the city of Al-Hamidiyya [in western Ahwaz], which is detailed below…"
According to the report of the Ahwazi Islamic Sunni Organization, on November 2, 2008, Iranian Army Air Force commander Gen. Hassan Shah Safi sent Al-'Amidiyya airbase commander Shahryar Hosseini Nejad a classified military document with instructions to prepare for the arrival of three MiG-31 warplanes. 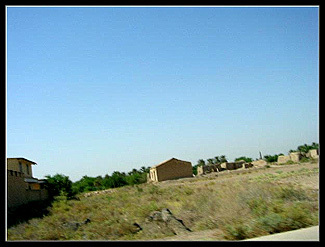 The instructions stated that all the pilots on base must prepare for special military maneuvers, and that all the information - "photos, films, and geometrical maps indicating the storage and deployment of missiles with chemical warheads - [must be forwarded to] Ali Qaramlaki, chief expert on weapon manufacture." The Ahwazi organization went on to state that the Al-'Amidiyya airbase houses three F-7 jets launched from underground installations equipped with special tunnels for takeoffs and landings. It assessed that the expected arrival of the MiG-31 warplanes is proof that they were purchased by Iran from Syria approximately 18 months ago. Furthermore, the organization revealed Iran's military plan to connect all the airbases in Ahwaz province, to set up additional bases for logistical support, and to connect the Al-'Amidiyya airbase to three islands belonging to Ahwaz province, as well as to the three islands contested by Iran and the UAE (Greater Tunb, Lesser Tunb, and Abu Moussa), apparently in order to build airfields there, as part of Iran's military plan - as is evident from satellite photographs taken by the UAE. 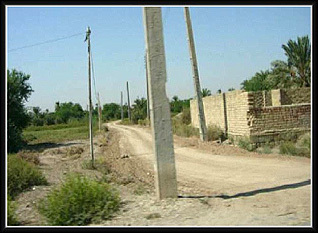 The Islamic Ahwazi Sunni Organization's report stated: "In the past, numerous reports by [various] elements claimed that, in addition to nuclear weapons, Iran has a program to develop chemical weapons inside Iran," in violation of the Treaty for the Prevention of the Proliferation of Nuclear and Chemical Weapons [sic, probably NPT and CWC]. Furthermore, "after the April 15, 2005 intifada [the Ahwazi rebellion against the Iranian regime], it was repeatedly reported that chemicals were conveyed to southern Ahwaz for unknown reasons. However, it has now been discovered that Iran is developing chemical weapons and that the transporting [of chemicals] to Ahwaz four years ago was for the purposes of burying the waste from their manufacture." The organization stated that in Iran, there are two plants for the production of chemical weapons: the Aghajeri chemical plant, situated between Al-'Amidiyya and Behbahan, and the Shaznad plant, situated next to the Arak factories in northern Ahwaz. It also said that, according to Western reports issued several months ago, Iran transferred its first sea transport of chemicals as part of its missile program, including missiles installed on warplanes, which Iran is now trying to adapt for carrying chemical warheads. The organization further claimed that Iran is trying to obtain sulfur for military use. The Ahwazi organization also reported that the IRGC had established, in the western Ahwaz city of Al-Hamidyyia, four camouflaged military bases spaced some two kilometers apart. It said, citing an IRGC source nicknamed "Al-Dalil Al-Amel," that the bases' access roads were secret and difficult to negotiate, and that only IRGC personnel were permitted to use them. Likewise, said the report, the area is surrounded with observation posts and night-vision surveillance cameras, and training sheds are scattered throughout. It said that these bases were set up for training local elements from the Persian Gulf as well as special forces, which would in future operate in their respective countries - Saudi Arabia, Kuwait, the UAE, and Bahrain. According to the report, these forces had been trained to carry out operations in the Gulf countries, particularly Saudi Arabia and Kuwait - operations that would be rapid and unpredictable, would cause great damage, and would not arouse any suspicion of Iranian involvement. The organization said that the headquarters of these bases were situated entirely in the Gulf region; that they had maps of and information about the targets in this region; and that these headquarters had confirmed that 12 cells had already been trained and had begun to carry out operations for Iran: smuggling large quantities of weapons, ammunition, explosives, and drugs into Iraq and from there to Kuwait and Saudi Arabia, and storing smuggled weapons in Saudi Arabia and Kuwait so that no Iranian connection could be discerned. The organization said that the bases' supreme leadership belonged to the IRGC, but were actually led by Hizbullah, and that their training methods were identical to the defense and warfare methods used by Hizbullah. It said that this was because of a decision by Iran to establish fighting groups like Hizbullah that were, like Hizbullah, capable of waging internal war in the cities and streets in time of war. 1) A base in the south of the city, for logistical support, with civil and military services such as garages for repairing military vehicles, a hospital with a full medical staff, and mobile hospitals for time of need. 2) South of the above base is a base belonging to it, with fortified storehouses of weapons, equipment and fuel; it is heavily guarded by IRGC special forces. 3) A base north of the city, also for providing logistical support; in 2003, a military airport was set up in it, for use by aircraft for attacking specific targets in the Gulf, Kuwait, southern Iraq, eastern Saudi Arabia, and Bahrain. 4) A base with hidden warplanes and missiles equipped with warheads banned by international treaties, as well as surface-to-surface missiles. The Ahwazi Islamic Sunni Organization notes in its report that Iranian special forces are responsible for training birun marzi ("outside the country") forces operating outside Iran, such as Hizbullah, Hamas, and Houthi (Yemen) forces, as well as sleeper cells in the Gulf and Arab countries. It says that these forces can provide their operatives with diplomatic passports, and possess advanced weaponry and the latest vehicles. Their operatives speak several languages, including fluent Lebanese Arabic, and are responsible for assassinating senior officials. The organization adds that these forces have the capability to carry out operations using biological or chemical weapons, and that they have a direct line to the IRGC leadership and coordinate with Iranian intelligence apparatuses. These forces, it says, have received and deployed dozens of platforms for launchers equipped with Fajr-2 and Shihab-2 missiles that can reach southern Iraq, Kuwait, and eastern Saudi Arabia, and that they can strike specific targets. The organization also says that in October 2008, three military maneuvers were held that included all aerial and land forces in the four bases at Al-Hamidiyya with the participation of Arab army personnel under IRGC command - including Hamas, Hizbullah, and special Iranian forces, and several groups of independent Iranian sleeper cells in Iraq and in several regions of the Gulf. According to the report, these maneuvers included a presentation of all plans concerning attacks on targets in the Gulf, including American targets, immediately upon receiving orders from the IRGC leadership. It also said that the readiness of the forces, missiles, and aircraft that would participate in the attack had already been ascertained. The organization claimed that six months ago, the IRGC had obtained a sophisticated Chinese radar system (originally called Rakib) and had installed it at the Al-Hamidiyya bases, and that its radar covered most of the western and southern areas of Ahwaz. It said that the system was explosion-proof and could identify stationary and moving objects such as aircraft, ships, and armed forces encircling the region. It could also disrupt enemy communications and withstand enemy attempts to disrupt communications during military activity. The organization said that the Al-Hamidiyya military bases had massive defenses, including antiaircraft missiles, and that in addition to its ground defenses, there are closely-spaced air defense forces, armed with Mithak-2 shoulder-fired missiles. "1) To [lobby for] international intervention to inspect the Al-'Amidiyya base, the Arajeri plant situated between Al-'Amidiyya and Behbahan, and the Shaznad plant in northern Ahwaz. "2) To take steps to dismantle chemical weapons that Iran is producing in Ahwaz, because those harmed first by this are the Ahwazi people and the land of Ahwaz, and after that the Gulf countries and the Arab Gulf. "3) To take serious steps to condemn Iran and to prosecute it for violating international law concerning the ban on the use of chemical weapons. "4) To take steps to dismantle Iran's weapons throughout Ahwazi territory. "5) To protect the Ahwazi Arab people from the consequences of [the military nature of life] in Al-Ahwaz." The full report was posted at http://www.sonnaalahwaz.org/Central-Archives/Al-Q/20090714-04.html.